Wow! €200k for the extra bedroom. Yeah, I remarked in some of my earlier price/sq.ft. analyses that you pay a massive premium for 4-beds in Dublin. They’re even more expensive than 3-beds when measured by the sq.ft., whereas in the rest of the country you seem to get more economy of scale with prices per sq.ft. going down as you go to bigger houses. And one more time … about half the houses (1440) in the 3-bed graph were semi-detached – maybe just enough to give reasonable samples. So here’s a graph specifically for 3-bed Dublin semi-d’s. The recent spike seems even more noticeable here, perhaps reflecting the greater desirability of those houses. However, that last data point is based on a mere 18 houses. There is still a vast gulf between anecdotal (“everything is going 100k over asking and nothing is available under 400k”) and statistical data. I think ps200306’s reply explains it easily enough. If you do a search on myhome.ie you can choose a region/postcode. In Dublin you have a choice of any of the Dublin postcodes, or just Dublin, or Dublin south, north, west or county. All of those fall within my definition of Dublin since I’m using the myhome data to drive this. There really is no such thing as a ‘Dublin’ market. Treating Balbriggan and Monkstown as one market just causes confusion. This must by the reason why the CSO and the anecdotes (which I believe to be true) paint almost completely different pictures of the market. This site is too SCD centered, and is trying so very hard to be pessimistic in the face of contrary evidence. In many areas, property prices are still in the toilet. Updated with snazzy polynomial trendlines. Go long 4-beds and 3-bed semis. Short everything else. On a more serious note, I would advise against including May 2014 numbers, or even April 2014 numbers. It takes ~45 days for 95% of properties to make it into the PPR. Id avoid using the last 2-3 months as the data is incomplete. You may get something very different when you look at it in a few months time. Especially when looking at averages. Median may be slightly more robust. Incidentally how normal is data? Also given the low numbers of data - 3 month average are probably the shortest time period you can do any stats on give the low numbers. In additon, some new 3 bed houses are coming up for sale. The release of a scheme may seriously effect any analysis. With a bit of work I have the capability to slice up different sections of the Dublin market (and rest of country). The problem is that none of the resulting datasets will be big enough to be representative. You will end up with a collection of random points. The bottom line is that the current property market(s) is too small for a very convincing analysis and this is just an attempt to do something/anything better than reading chicken’s entrails. Yeah, I’m just playing with my shiny new toy at the minute … experimenting with some homegrown infrastructure and fancy-schmancy Java 8 streams and lambdas for stats. Will firm it up for future efforts and decide what data to use when. Will look at (your?) 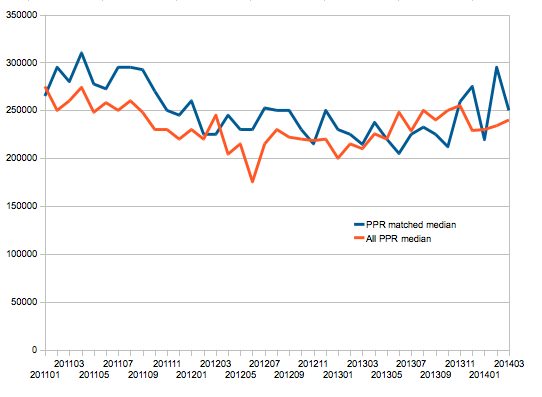 previous threads on how quickly the PPR matures. Id avoid using the last 2-3 months as the data is incomplete. You may get something very different when you look at it in a few months time. Yep. See my reply to Mantissa. Especially when looking at averages. Median may be slightly more robust. Incidentally how normal is data? Very good point. On checking, I see the averages have quite a serious right skew to higher numbers. Medians are considerably lower and I may switch to that in the future. Also given the low numbers of data - 3 month average are probably the shortest time period you can do any stats on give the low numbers. In additon, some new 3 bed houses are coming up for sale. The release of a scheme may seriously effect any analysis. Sad but true. I may switch to reprocessing these numbers at the same time as my 3-monthly price/sq.ft. analysis. Might have to take on an assistant if the workload gets any bigger. 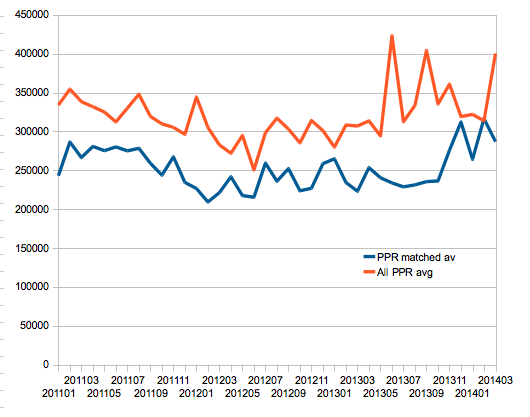 Here is a graph of the average “matched” sell price (from your data) vs the PPR Dublin all-property average. 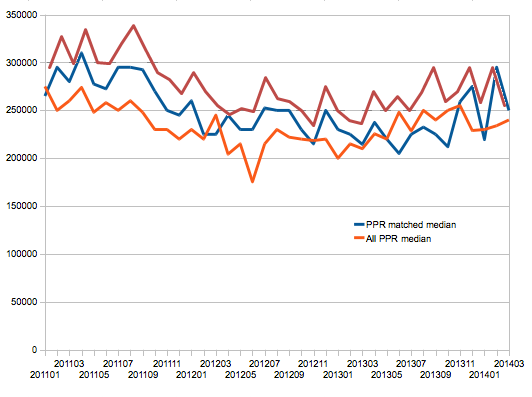 You’ll see the outliers in the “all PPR” data skewing the averages in some months, which obviously throws things off. Even so, there is pretty much no correlation between your numbers for 3-bed houses only, and the “all PPR” average (r=0.26). Not that surprising I guess. And it emphasises the importance of this sort of analysis – most people don’t care about “property”, they care about specific types of properties in specific areas, and the two are not necessarily correlated. (Omitting April/May 2014, correlation is the simple CORREL() Pearson correlation). Thanks for the analysis. I hope the May figures don’t finish the way they started. Your price per square metres figures are also very useful for me. 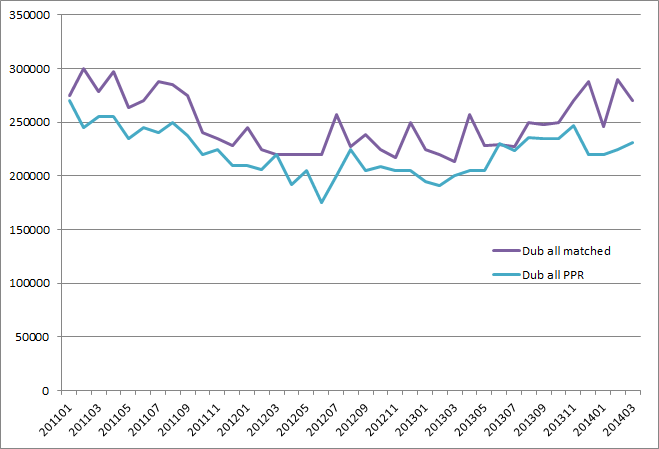 Here is the “matched” median data for Dublin 3-bed houses as per your data vs all-proprtty Dublin median data. Somewhat closer but still nothing to write home about (r=0.53). Gets worse in the last year or so. What do you make of all your averages and many of the medians being lower than the overall PPR numbers, which also contain apartments etc. Does that tell us anything about your data? Is there any risk of sample bias? Ta for that. I’m fairly satisfied that they are following the same rough trends. I’m not particularly surprised at the variances given the low sample sizes. So my guess is just that the average price for 3-beds is lower than the overall market average for housing. I can check that by taking numbers from my data for all houses and apartments and see where that gets us. I also have a category for commercial which I’ll continue to leave out (farms, offices, retail and industrial units, etc.). I also leave out auction results by default, but I can include those too. Here you go. I haven’t cheated by checking how these numbers differ, apart from noting the sample sizes are much bigger (6,747) as expected. EDIT: Apologies. Found a buglet that caused PPR median price to actually be the asking median price instead. Fixed in link above and for 3-beds on the original post. Didn’t have your data so I graphicked the “fixed” all-PPR matched median onto your graph (red line). Doesn’t look like much of an improvement, and bears some investigation. Perhaps I’ll first try to reproduce your graph from the PPR data. Another day’s work, though. Clearly something is amiss. My version of the median PPR price for all Dublin properties (light blue line) differs significantly from yours (orange line). Could you describe to me how you calculated your median?